is up and running and quite frankly, her home is a bit more in keeping with what my friends and readers look forward to each week. Hi everyone! 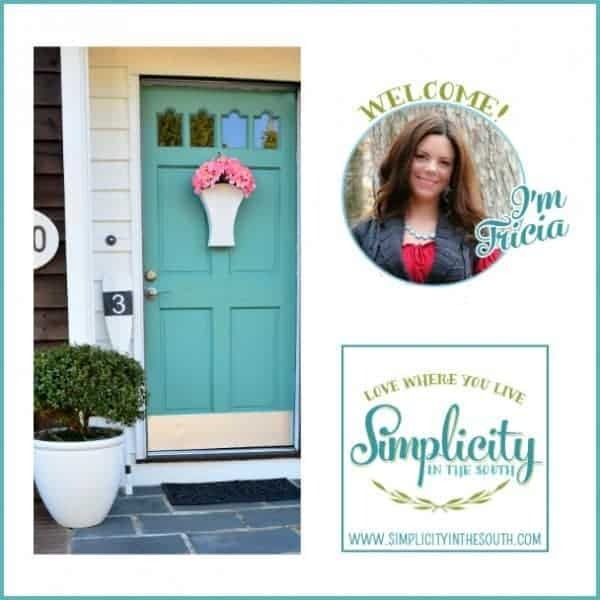 I’m Tricia and I share DIY home improvement projects, crafts and organization ideas over at Simplicity in the South. I was delighted when Debbie asked if I would share my home with all of you! My husband and I have lived in our home in the upstate of South Carolina since 1998 and we are raising our three boys here. Our 1980’s ranch home is 1644 square feet with three bedrooms and two baths. Although our house is small, we love the location and feel lucky that we have wonderful neighbors. Our property sits a football field’s length off the road and backs up to a 7,000 acre state park. We get to enjoy having tons of privacy in our back yard and it’s great place for the boy’s to play. My husband added our family room when we found out that boy #2 would be part of our family and it is my favorite room of the house! 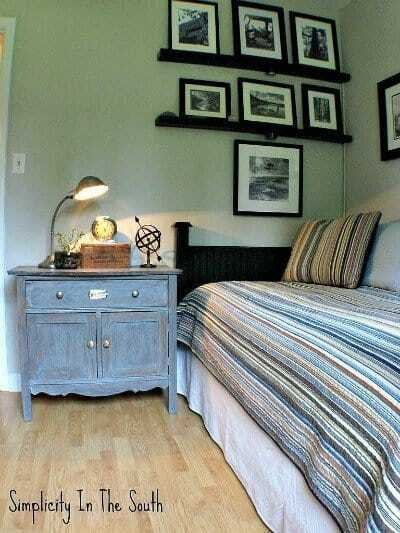 My decorating style has evolved over the years, but I would describe it as mix of casual, coastal and vintage-classic. 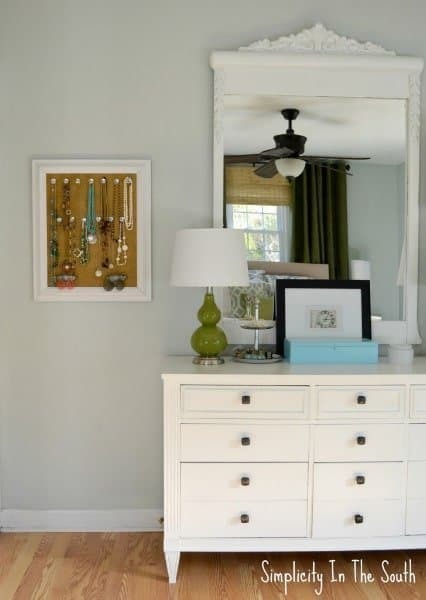 I love mixing textures and neutrals but adding just a touch of color. This is our living room. This was the first room I tackled after I conquered my fear of the miter saw. I put up the wainscoting throughout this room. Since we don’t have room for a mudroom, I added coat hooks by the front door. My current project is extending the board and batten down the hallway that you see to the left. I really wish I could show you the entire kitchen, but it looks like a construction zone! It seems like our home is always a work in progress. We are in the middle of repainting the cabinets, replacing the backsplash and installing new countertops. Here is the other side of the kitchen where we have our drop station and breakfast table. 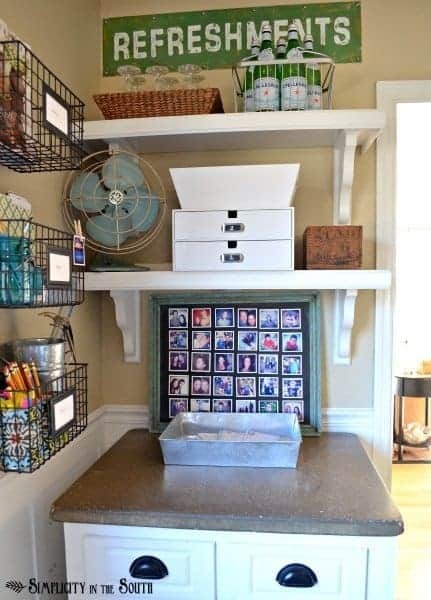 Since we live in a small home, I have to find ways to maximize storage and keep things organized. This is our small 3 1/2′ x 9′ laundry room that utilizes storage space all the way to the ceiling. The first bedroom that you come to when you go down the hall is our teenage son’s bedroom. 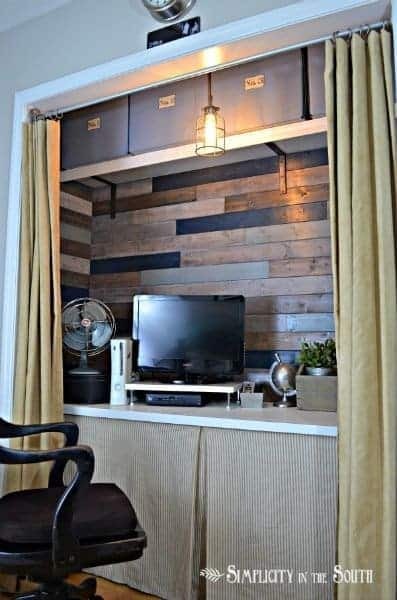 Since his bedroom is 10 feet by 11 feet, I saved room by converting his closet into an office. His folded clothes are hidden in drawers underneath the box pleat skirt. 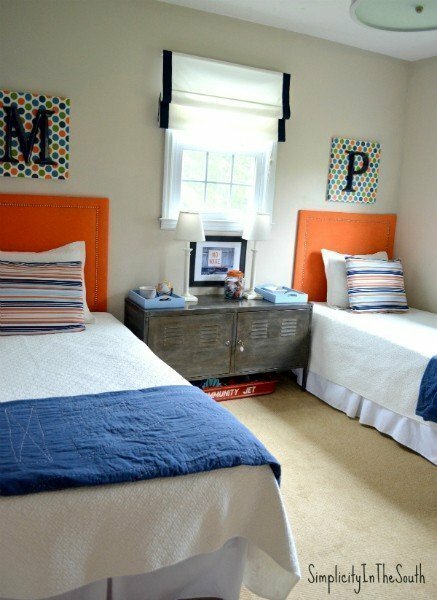 I had so much fun decorating our younger two boys’ shared bedroom! 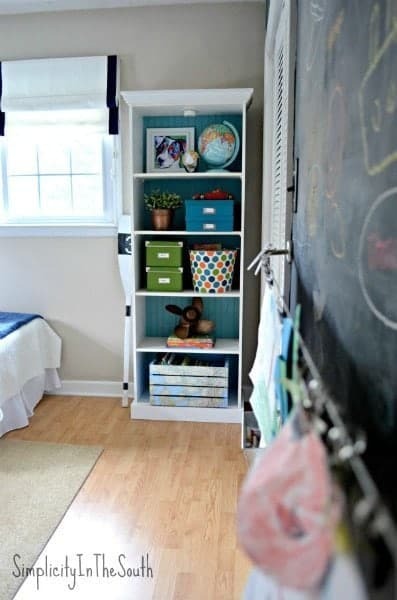 The boys get a lot of use out of their chalkboard wall and artwork hanger. 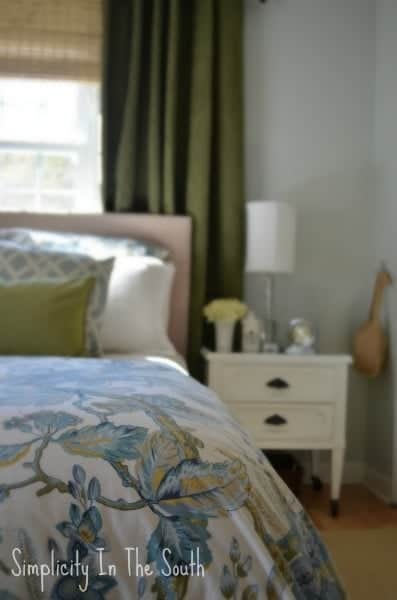 Our master bedroom has gone through many changes, but I have settled on this serene combination of blues and greens. 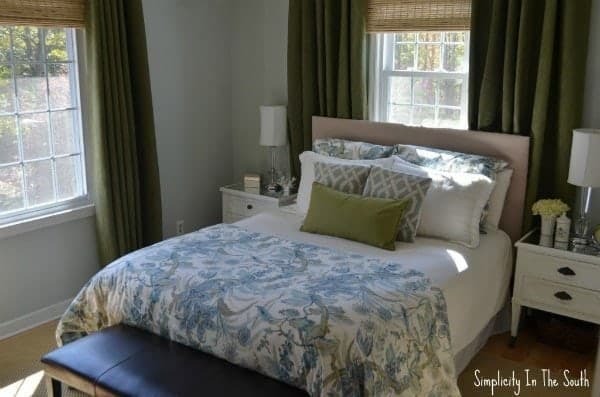 The walls have been off-white, yellow, green, dark brown, and now they are Benjamin Moore’s Cashmere Gray. I’m pretty sure I’ll put the paint brush down for a little while, at least for our bedroom. I hope you enjoyed the tour of our cozy, little home. I hope you’ll stop by Simplicity in the South sometime and say hello! Again, thank you, Debbie for inviting me to share it with everyone! Thank you so much Tricia..your home and style are just wonderful and I am so glad you got to share today. It’s all beautiful as well as clever and creative. Great tour Debbie, love the baskets in the laundry room and the kitchen is charming. Tricia has a beautiful home! I love the family room with all those big windows. It looks like she makes great use of every square foot in her home, too. Thanks for sharing Tricia’s home with us, Deb! Have a great weekend! Wow! I love Tricia’s home. I love the refreshments sign that is so great. I am hoping over to check out her blog now. Love this post of her home. 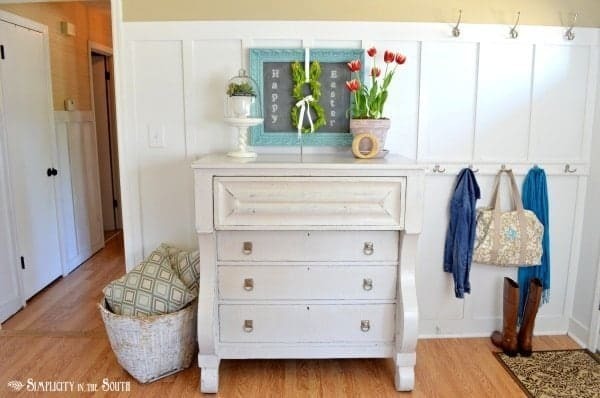 She has a beautiful and tastefully decorated home. Love South Carolina too she is a lucky girl to live there. Oh my goodness, I’m loving all the giant windows in that house! That living room is absolutely amazing! WOW! I am jaw to the chin in awe over here…your home is so so cozy and I love every thing about it! Your organization skills are fantastic- WOW .. in serious Wow…mode- did I mention I am WOW-ed over your home? Gorgeous! Love the zinc cabinet!!! And the little chalkboard entry…so cute! Thanks, Debbie and Tircia, beautiful hme. 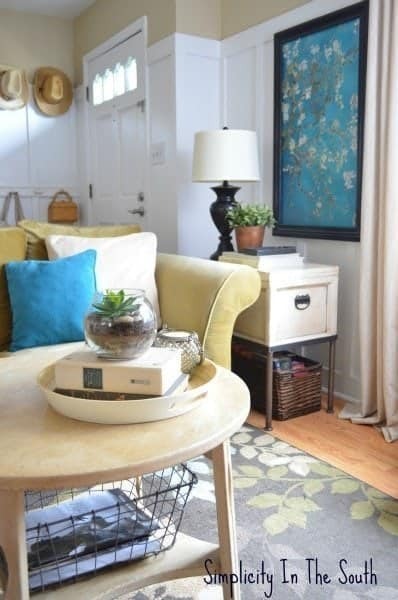 Everything room is so bright and and pretty and I love all the organizational tips to keeps everything looking neat. 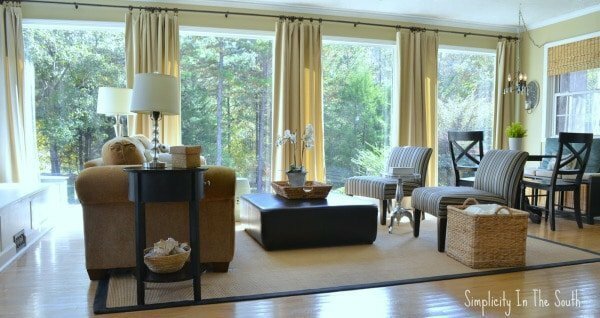 I love the window treatments in the family roomas I have some floor to ceiling windows, too, that have stumped me. The laundry room is one of the cutest I’ve seen, too!! You are so right, it is darling! 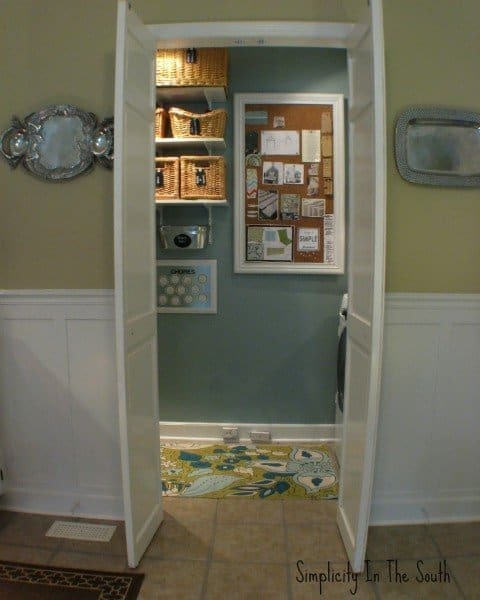 Wow…that Tricia has some crazy awesome style…that closet office is to die for, and I think I would do laundry all day long if my laundry room was so pretty…and the entryway…should I keep gushing? A very cozy home. 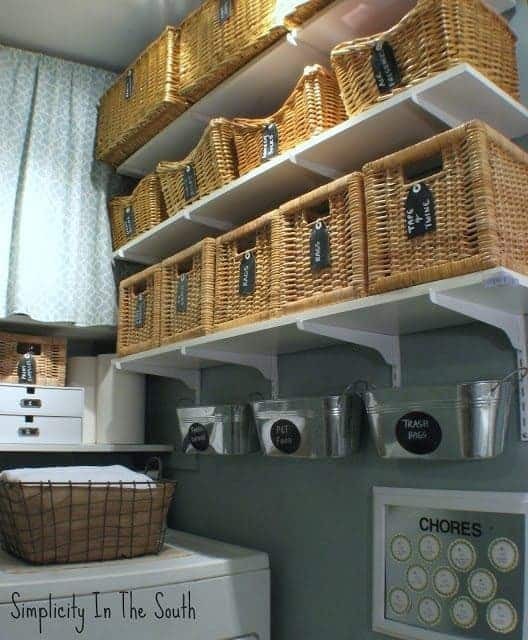 I too live in a small ranch and have to get creative with storage… hahahhaaa.. my dishes especially. WOW – stunning! You have an unbelievable beautiful home, Tricia! 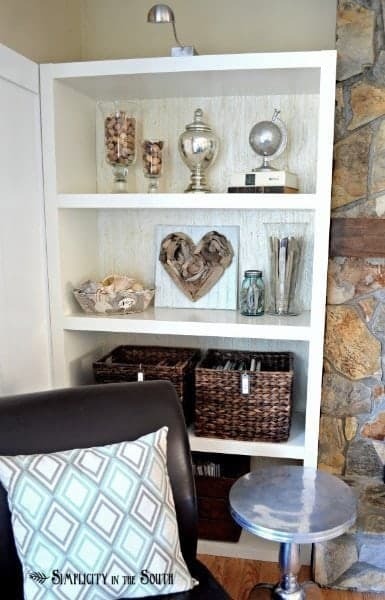 Tricia…you home is beautiful and filled with so many wonderful and creative ideas…I love all of your storage solutions and you did a fantastic job on the wainscot..Love the closet turned office…!! Debbie, thanks for presenting Tricia’s home to us…I so enjoyed the tour! !…she is a very talented person! Have a great weekend! What a beautiful house! Heading over now to check out her blog! What a lovely home…the widows and all the light are incredible. The board and batten is to die for! I really enjoyed the tour. Tell Reese some other time! Tricia’s home is beautiful!! I kept scrolling up and down to make sure i didn’t miss anything! I Loved it What a great Tour and those windows!! Tricia’s got style to spare! I love this house with all its personal touches and truly classy, solid decor concepts. I noticed a lot I’d like to incorporate into my own home. Thanks for sharing! Hugs and thank you for sharing! Your house is a wonderful mixture of class ,casual and beauty. Way to use up every inch of the house without making it look cluttered!! Outstanding!!! I am a fan!